The Archives & Special Collections Library is part of the Vassar College Libraries system. It holds the rare book, manuscript, and archival collections of the college. It collects, preserves, and makes available rare and unique collections, and also engages in teaching and outreach activities. A tradition of exposing students to rare books and other primary sources at Vassar College can be linked to the founder, Matthew Vassar. In establishing a school “for the education of young women in literature, science, and art,” the founder and early trustees believed that they must not only hire qualified faculty, but also provide useful resources for students. One expression of this belief was Matthew Vassar’s purchase of art works and books from the Rev. Elias Magoon, one of the first trustees. These materials would be used in teaching to provide a proper laboratory for the study of art and related subjects. Several rare book and manuscript items purchased by Vassar from Magoon were placed under the care of the library, and are now housed in the Department of Archives & Special Collections. Of special note is a printed French Book of Hours, dated 1498. Although these initial activities are noteworthy, special significance must be given to the efforts of Lucy Maynard Salmon, professor of history at Vassar from 1887 to 1927. Salmon was a pioneer educator who exerted a strong influence on the historical profession. She is especially well-known for her work relating to the sources used by historians to write history. Salmon believed strongly that students should learn directly from primary sources, and she integrated such sources into her teaching at Vassar. As a result, over the course of her career she influenced scores of students through her revolutionary approaches and techniques. In addition, Salmon wrote a book on historical material and even developed an important collection of historical materials herself which she drew upon in her classes. What is more, she helped found the Vassar Alumnae Historical Association, which donated valuable books to the library and encouraged other alumnae to do the same. Salmon left a vibrant legacy of interest in original sources among both faculty and students at the college. Interest in rare books and primary sources on the part of the teaching and learning community at Vassar led to the acquisition of these kinds of materials by the library. During the early 20th century many outstanding collections of rare books and manuscripts were donated by alumnae, faculty, trustees, and friends. Gifts of alumnae were especially noteworthy. They included medieval manuscripts and early printed works from Ada Thurston, ’80; a Turgenev collection from the Class of 1882; Quaker books from Mary Taber Bacon, ’98; gardening books and herbals from Helen Morganthau Fox ’05; rare maps and atlases from Loula Lasker ’09 and Jocelyn Harrington Breed ’36; books relating to women from Alma Lutz, ’12; a book of hours and other early works from Rebecca Lowrie, ’13; children’s books from Elisabeth Ball ’22; and incunabula from Mary Crapo Hyde Eccles, ’34. Gifts of faculty and trustees included historical sources from Lucy Maynard Salmon; medieval manuscripts from Henry Noble MacCracken; first editions of Coleridge from Alice Snyder; books on socialism and Robert Owen from Herbert Mills; and an assortment of texts from Francis Fitz Randolph. Among gifts from friends of the college were a set of the rare Audubon double elephant folios from Charles Senff in the late 1890s; a collection of books and other materials on the Village Press from Mitchell Kennerley; a large collection of materials relating to the periodical press from Henry Justice; and many examples of fine printing from Mabel L. Rossbach. During this period some interesting collections of personal papers were added to the library, such as the papers of founder Matthew Vassar; papers of Indian agent Jasper Parrish; papers of astronomer Maria Mitchell; the Jesse Isidor Straus Autograph Collection; and papers of anthropologist Ruth Benedict, ‘09. The library devoted some attention to collecting materials relating specifically to Vassar College, but this was not really an organized effort. The focus at this time was not so much on collecting institutional records from the offices and departments of the college, but rather on the collection of publications and the development of a print-based Vassariana collection. Cornelia Raymond, the daughter of former Vassar president John H. Raymond who for many years worked in Public Relations for Vassar until retiring in the 1930s, created many biographical files for people associated with the college, and these eventually were transferred to the library and became a building block for the archival program. The librarian who worked most closely with the growing special collections at this time was Dorothy Plum, ’22. Plum worked in the library from 1927 to 1965. From 1946 she was Bibliographer and head of the Bibliography Department, and in this role she oversaw many activities relating to special collections: housing, acquisitions, preservation, reference, teaching, and exhibitions. The Cataloging Department was responsible for the cataloging of rare books. Plum created a number of narrative descriptions of the collections, and wrote annual reports for the Bibliography Department which reviewed accomplishments and challenges for the special collections. She also taught a course on Bibliography, which introduced many students to the world of books and gave them important research skills. During the early 1960s, when the college celebrated its 100th anniversary, Plum served as the Centennial archivist. As part of this work, she produced The Great Experiment: A Chronicle of Vassar, a chronology of the life of Matthew Vassar and the first hundred years of the educational institution that he founded. This work has served as a helpful reference source over the years. For many years Plum was assisted by Eleanor Rogers, and others. By the middle years of the 20th century Vassar had developed some interesting rare book, manuscript, and archival holdings. With these resources came special challenges. The primary concern then was a lack of appropriate space. Rare and fine books were scattered throughout the library; they could be accessed with the help of library staff, but this was not an easy process. Moreover, there was no central space to make use of special collections. In a 1955 article on “Some Library Treasures” in the Vassar Quarterly, Librarian Eileen Thornton stated that the lack of a physical center was a real problem, “considering the extent of use now made of these materials and the use that would be made were they centralized and better systematized.” Thus students, faculty, and others were unable to make full use of the existing resources. During the early 1960s the Bibliography Department was temporarily transferred to Rockefeller Hall, where it remained for three years in order to allow for renovations to the Thompson Library and the creation of better facilities for the special collections held by the library. The library attempted to focus more attention on its growing special collections in 1965, when Frances L. Goudy was appointed the first Special Collections Librarian at Vassar. Goudy had served in several positions before coming to the college, most recently as reference librarian at Georgia State College. She served as Special Collections Librarian until 1982, and oversaw activities relating to special collections, such as acquisitions, reference, and exhibitions. When the Bibliography Department returned to the Main Library, the library tried to centralize the special collections, as many had called for in the 1950s. Special collections were located in and near the current Stack 1 of the library, on the ground floor. Staff offices were located here too. A special vault area offered protected storage for especially valuable items. Goudy worked with Eleanor Rogers and other colleagues in this location for many years. The creation of this area represented an attempt to consolidate the special collections, but difficulties remained: the area was out of the way and did not fill the needs of a growing library. At the same time, the Main Library itself was in need of expansion. These factors led to planning for a new addition to the library. This new addition, opened in 1977, was called the Helen D. Lockwood Library, in honor of a former English Department faculty member who also was one of the most important donors to the college. The Lockwood Library provided space for the Francis Fitz Randolph Rare Book Room, which was dedicated in May of 1977. The Rare Book Room featured a reading room for special collections and staff offices. Additional stacks for materials were located directly below, on the ground floor. The Rare Book Room honored a trustee and good friend of the college who also collected rare books and in fact donated a number of important and interesting volumes to the library. For the dedication of the new Rare Book Room, Mark Twain Goes Back to Vassar, a booklet by President Alan Simpson, was published. 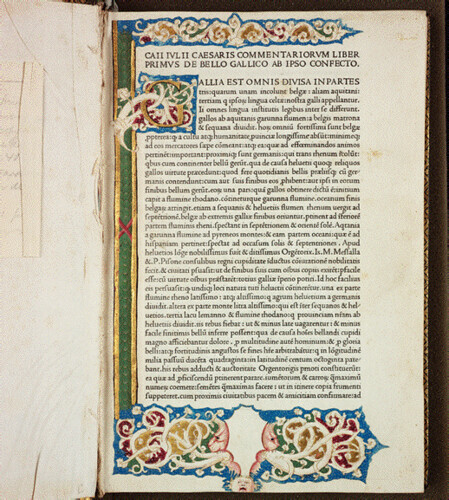 At the same time A Checklist of Western Medieval Manuscripts and Incunabula in the Vassar College Library was also published. The new facilities represented an improvement, and led to increased interest and use of special collections by students, faculty, and outside researchers. As noted in the 1978 annual report of the Reader Services Department, use thereafter increased by approximately 32%. The tradition of teaching students to use rare books and primary sources, which had persisted in various ways for decades, was thus strengthened through the acquisition of better facilities. There were several major rare book and manuscript acquisitions during Goudy’s tenure which expanded the breadth of Vassar’s collections, and continued the tradition of outstanding donations from alumnae and friends of the college. Of special note was the addition of the Mark Twain papers, a collection of books and papers from Louise Seaman Bechtel ’15, and the Alfred C. Howell Aucassin et Nicolette Collection. The Twain papers were added as part of the Jean Webster-McKinney Family Papers (Jean Webster ‘01 was a great-niece of Twain), and came to the college in 1977, as the gift of Jean Connor, daughter of Jean Webster, and her husband Ralph Connor, a former trustee. Mainly family papers, they consist of letters, manuscripts, notebooks, diaries, account books, clippings, photographs, and a variety of other materials. They form an important part of the legacy of Mark Twain. An important collection of children’s books were donated to the library by Louise Seaman Bechtel ’15 along with a collection of her personal papers. This collection of approximately 3,500 titles substantially added to previous collections of children’s books, and provided a rich resource for students and researchers. It is especially strong in the area of English and American literature for children from the 19th and 20th centuries, though other examples are also present. An exhibit and accompanying booklet on the collection were produced in 1990. The Aucassin et Nicolette Collection represents a unique collection of editions of the medieval tale, dating from the 18th to the 20th century. An impressive and useful bibliography accompanied the collection. Since the early 1960s Dorothy Plum had called in her annual reports for more attention to the Vassar College Archives. According to the Governance of Vassar College, the library was responsible for archival material. Unfortunately, up to that point materials were scattered, bibliographic control was inadequate, and preservation steps, such as microfilming, were needed. In 1980 a President’s Advisory Group was formed to look into this issue; members included Dean of Studies Colton Johnson, Librarian Barbara LaMont, and faculty members Elizabeth Daniels and Professor Beth Darlington. The group worked with Nancy Sahli ’67 to assess the situation. Sahli, an archivist at the National Archives, met with representatives of the college, examined records, and submitted a report to the president. Despite its unique functions and growing responsibilities, the special collections area continued to operate as part of another library department throughout this period. For many years it reported to the head of Readers’ Services, and its activities were described in the annual reports of this officer of the library. By the early 1980s it had become clear that changes were necessary in the way special collections were administered in the library. The tradition of collecting and using primary sources had existed at Vassar for over a century, and recent developments had led to an increased interest in these materials. In addition, President Virginia Smith sought to expand the connection to primary sources at Vassar by acquiring new rare book and manuscript materials. Her interest and foresight was crucial. As a result of these factors, Special Collections was designated a distinct department of the library early in 1982. Not only was the Special Collections Department created in 1982, but there were changes in staffing. Frances Goudy retired as Special Collections Librarian after nearly two decades of service, and a Curator of Rare Books and Manuscripts was hired to provide additional professional expertise in the management of this area. Lisa Browar served in the position of Curator from1982 to1987. As the first Curator, Brower directed the activities of a newly-established but active department. About a year later, Nancy MacKechnie joined the staff as Assistant Curator of Rare Books and Manuscripts. In 1984 Eleanor Rogers retired after 40 years of service. She was succeeded by Melissa O’Donnell. When Brower departed in 1987, MacKechnie became the new Curator, a position she held until 2000. For much of MacKechnie’s tenure, the Assistant Curator position was unfilled. Despite the loss of a staff position, much work was done in this period, particularly in the creation of finding aids for collections, the continued mounting of exhibits, and the development of the first departmental website. Other staff and student assistants contributed to departmental work as well. Efforts to acquire significant and substantial manuscript holdings continued in the period after 1982. For many years the focus had been on personal papers relating to alumnae, faculty, and others with connections to the college. Because of Vassar’s long standing as an institution of higher education for women, this resulted in many collections relating to the history of women and the contributions of women to various fields. This focus persisted, and after 1982 papers of the poet Elizabeth Bishop ‘34, and novelist and writer Mary McCarthy ‘33 were added to Special Collections. These have become key holdings of the department, and represent a strong effort to continue the tradition of manuscript acquisitions. In particular, the Bishop collection has drawn researchers from all over the world, and has for many years been the most heavily used collection in the department. What is more, these holdings have spurred interesting and creative exhibits, conferences, and programs at the college. Journals and papers of local naturalist John Burroughs, who during his lifetime had regular contacts with the college, were also acquired during this period. Important rare books were added as well. Virginia Smith, Vassar’s president from 1976 to 1986, gave great administrative and personal support to the development of the college’s collection of manuscripts. To a considerable extent, then, the scholarly reputation of the department can be traced to her influence. These efforts were furthered by a grant from the Pew Memorial Trust of Philadelphia in 1981. After the appointment of Frances Fergusson as President of the college in 1986, there was renewed attention given to the possibility of creating an archival program. An Archives Advisory Committee was appointed, consisting of administrators, faculty, and librarians. The committee worked hard to draft a proposal that would be accepted and approved by the Board of Trustees. At the same time, one member of the committee, College Historian Elizabeth Daniels, began a major project of surveying the records of the college. Daniels visited all offices and departments on campus, and, working with student assistants, compiled inventories of college records. In addition to recording data, the project also resulted in the rescue of many records from undesirable locations. Some records series, such as early admission records, were microfilmed as part of this project. In sum, these efforts represented a key first step toward gaining control of the historical records of Vassar College. The tradition of using primary sources in the classroom, which had been established by Lucy Maynard Salmon, and was continued by other faculty over the decades, persisted during this period. During the mid-1980s, for instance, two Interdepartmental courses were offered that drew heavily on the use of unique materials: Interdepartmental 384, "Living History: the Vassar Class of 1935," taught by Elizabeth Daniels, Anne Constantinople, and Marque Miringoff; and Interdepartmental 389, "Testimony of the Past," presented by Beth Darlington and writer Nancy Milford, the author of a biography of Edna St. Vincent Millay. A College Course dealing with the history and transmission of texts, “Transformations of the Word,” was offered by Robert DeMaria, Rachel Kitzinger, and John Ahern. These courses dealing with primary sources, and other classes like them, are a hallmark of the Vassar educational experience. During the 1990s plans were made for another expansion of the Main Library. As happened when the Lockwood Library was added, Special Collections were a significant part of this planning. While plans were made and the building began, several departments of the library, including Special Collections, moved to an off-site location on Boardman Road. Special Collections operated in this annex from 1997 to 2000. This situation was awkward for both staff and researchers, but the hope of better surroundings in the new addition served as light at the end of the tunnel. In 2000, the Special Collections Department moved back to the main campus and occupied new space on the ground floor of the new Ingram Library. Thanks to an unrestricted bequest of $2.5 million, the Catherine Pelton Durrell ’25 Archives and Special Collections was founded. When the Ingram Library was dedicated in 2001, a booklet on the treasures of Americana in Special Collections was published for the occasion. The new space brought together in one area a reading room, an audiovisual room, a seminar room, a processing room, staff offices, and the stacks area for the housing of materials. The seminar room, given by the Class of 1941, was named the Elizabeth A. Daniels ’41 Seminar Room in 2001. Exhibit space is available in the department and in cases just beyond the lobby of the Main Library. At the same time the name of the department was changed officially to “Archives & Special Collections,” in order to recognize the place of the college archives in the department. Ronald Patkus became the first Head of Archives & Special Collections in 2000. Patkus was assisted by Special Collections Assistant Dean Rogers, who had worked in other areas of the library in previous years. The department was also given permission to fill another professional position, and Julie Kemper became Special Collections Librarian in 2001, concentrating on rare book cataloging. Laura Finkel succeeded Kemper in 2004, and focused on manuscripts and archives. In recent years the department has continued a strong program of collecting. There have been substantial additions to existing collections, such as the papers of Elizabeth Bishop, Mary McCarthy, and Edna St. Vincent Millay. In addition, the department has acquired manuscript holdings in new areas. The papers of other alumnae and faculty have been added. In 2003, for example, the Morris and Adele Bergreen Albert Einstein Collection, which was formed by former faculty member Otto Nathan, was received. Many new rare books, relating to the history of printing and other subjects, have been added through gifts, bequests, and purchases. Perhaps the greatest development in recent years, however, has been the formal establishment of an archival program. In October of 2001, the Board of Trustees approved the Vassar College Archives Authority Statement, which formally placed responsibility for the preservation of historically significant records of the college with the Archives & Special Collections Department. This document laid the groundwork for future efforts to preserve materials that document the history of the college. Outreach efforts across campus have carried the archival mission further. Today the College Archives includes papers of the founder, Matthew Vassar, records of administrators, such as the Board of Trustees and the presidents of the college, and also a wealth of student materials, such as correspondence, diaries, and scrapbooks. In 2007 the Archives & Special Collections was given the status of a Library, like the Art Library, the Music Library, and the Visual Resources Library. As such, it functions as a unit of the Vassar College Libraries system. This administrative change reflects the status of the collection and its role in the curriculum and the programmatic activities of the college. There have also been efforts in recent years to integrate the department and its holdings more fully into the life of the college. Each semester a major exhibition accompanied by publications and programming, has been mounted in the Main Library. Teaching has increased in the department; courses such as “Detectives in the Archives,” “The Medium of Print and the History of Books,” and “Introduction to Bibliography and Scholarly Editing” meet in the seminar room and draw heavily on departmental holdings. Students in other courses, such as History 160, also use materials in Archives & Special Collections. And various projects utilizing new technologies have been devised to improve access to the materials for those both on and off campus. Over time, Archives & Special Collections at Vassar College has grown into an important part of the library and a key partner of students, faculty, and administrators. Truly significant collections have been developed, thanks to a tradition of interest in primary sources. Among the rare books, particular strengths exist in women's history, first editions of English and American literary and historical works, examples of fine printing, collections of courtesy and cookbooks, children's books, and rare maps and atlases. Important manuscript holdings, already mentioned, document topics such as literature, politics, and women’s history. The College Archives document the history of Vassar and its unique role in American history. The holdings of Archives & Special Collections are impressive and help rank the department among the most significant college repositories in the country.